This post sponsored by ALDI. All opinions are my own. My kids have started this thing where they expect tacos every Tuesday. Like, the littlest wakes up on Tuesdays and starts chanting “Taco Tuesday! Taco Tuesday!” before he’s even had his cereal. We’ve always done Taco Tuesday off and on but now it’s an issue if there are no tacos on Tuesday. 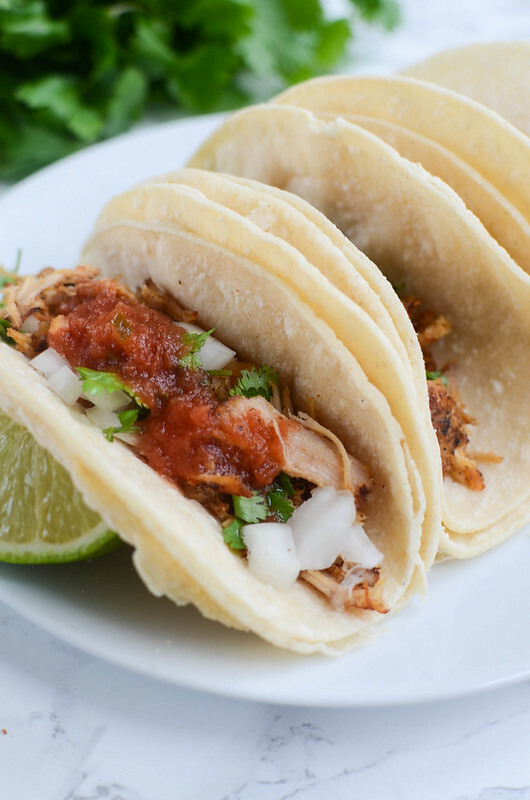 Which is fine, tacos are my favorite food ever, but man, I’m worried I’ll forget one week and have a full-on revolt on my hands. I headed back to ALDI for this post because I’m officially in love with the store. I wanted to do another price comparison and as you see, ALDI saved me over $10 on these tacos! Ten bucks! That’s almost a week of gas for the Jeep! One of the best things about ALDI is how affordable their organic products are. That carton of SimplyNature Organic Free Range Chicken Broth was $1.79. I went over to a bigger chain grocery store and picked up the national brand of Organic Free Range Chicken Broth for $2.88! So over a dollar in savings and that adds up. I got the exact same bag of onions at both stores, same label and everything. The onions at ALDI were $1.49, the ones at the chain store were $2.24. ALDI is able to save us that money by skipping things like bags. So make sure you bring some reusable bags with you and be prepared to bag your own groceries because that’s another way they save us money. They train their cashiers to be as efficient and quick as possible. As always, the spices were $1.19 and the national brands were all over $3! 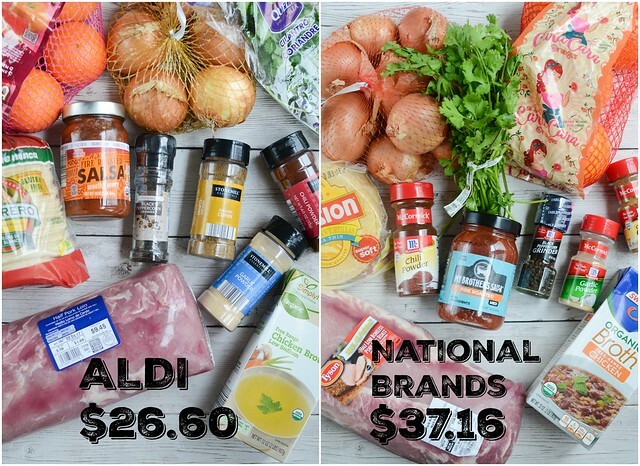 And I had to replace my pepper grinder because I totally dropped mine in a sink full of water the other day and was excited that the ALDI one was $1.69 compared to over $2 for the national brand! ALDI taste tests their products several times a year to make sure they are just as good – if not better! – than national brands. They also offer a Double Guarantee so if you aren’t satisfied with a product, they will refund your money and replace the product. My favorite thing about ALDI is how fast and easy I can get in and out. The store itself is smaller than your average grocery store and usually has only 4 or 5 aisles. So it’s easy to find exactly what I’m looking for. Plus, like I mentioned, the cashiers are super quick. I had the most amazing street tacos at this taco truck a couple towns over a few weeks ago. And I’ve since dragged all my friends out there to experience them. Now we’re all obsessed and head out there any time we have time. 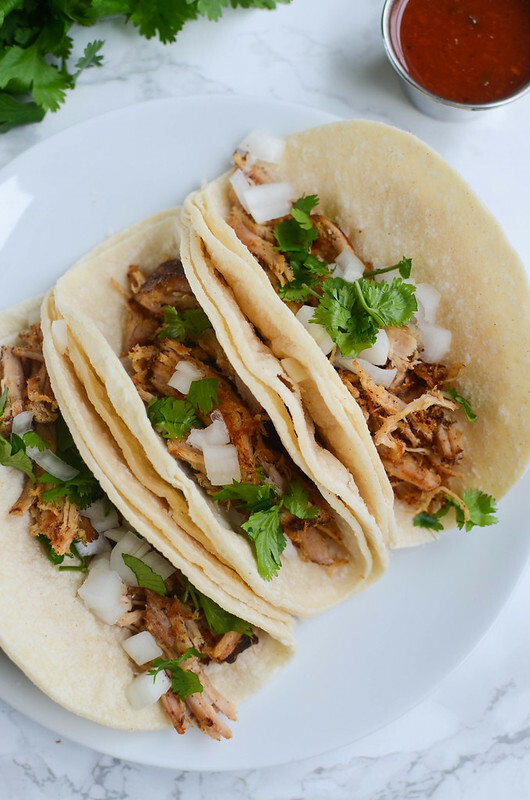 I love a super simple street taco with just the meat, diced onion, fresh cilantro, and maybe some salsa on top. So, that’s what I did here. The pork loin gets coated in spices and then browned on all sides before being transferred to a slow cooker to roast all day. You end up with delicious tender meat that practically falls apart. 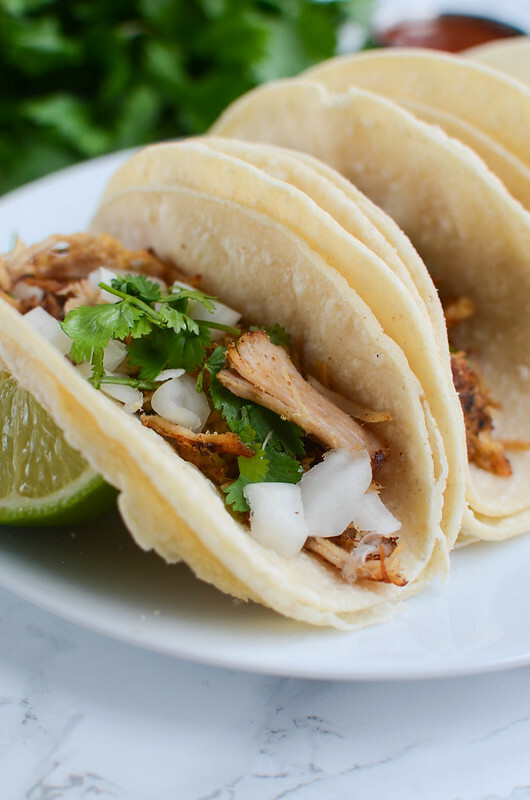 And then if you feel like dirtying a pan, the best way to enjoy these carnitas by crisping them up before putting them onto corn tortillas. And then just add your toppings and enjoy! Use the Rafflecopter below to enter for your chance to win a $200 ALDI gift card! In a small bowl, combine chili powder, cumin, garlic powder, oregano, salt, and black pepper. Pat the pork loin dry and rub with the spice mixture. Heat the olive oil over medium-high heat in a large skillet. Brown the pork loin on all sides and transfer to slow cooker. Scatter quartered orange and onion around the pork loin and pour chicken broth over top. Cook on low for 7 - 8 hours or high for 5 - 6 hours. Remove pork and use 2 forks to shred the meat. 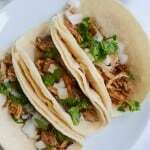 To assemble street tacos, stack 2 corn tortillas and spoon the shredded pork on top. Top with salsa, white onion, and cilantro, if desired. Serve hot.